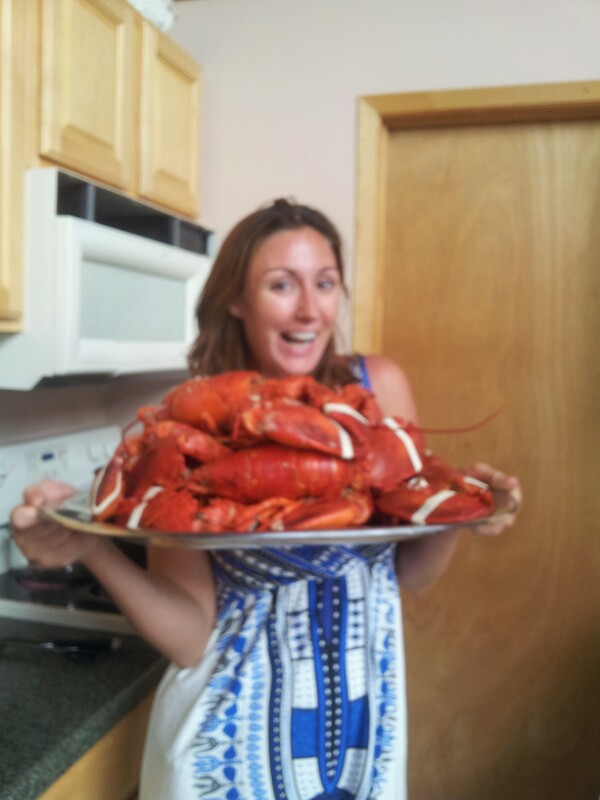 Fisher’s Island NY lobsters are undeniably the best. 1. Heat a Dutch oven over medium-high heat. 2. While the Dutch oven is heating, break down the lobsters: Remove the claws and place them in a bowl. Twist the heads off the tails. Add the tails to the bowl, and refrigerate. Pull the outer shell of the head off each body; discard the outer shells. Remove and discard the lung sacs, leaving the tomalley (the soft green paste). Finely chop the bodies with a cleaver. 4. Add the wine and cook until it has reduced by about one-third, about 3 minutes. Add the tomatoes and their juice. Reduce slightly, about 2 minutes. Add the chicken broth and 1¾ cups of the milk; bring to a boil. Reduce the heat to medium-low and cook at a steady simmer, uncovered, for 20 minutes; the liquid should reduce by about half. Let the stock cool for a few minutes. 5. While the stock is simmering, remove the claw and tail lobster meat from the shells, working on a rimmed baking sheet to reserve any juice. Add the juice to the simmering stock. Roughly chop the lobster meat (there should be about 1¼ cups), and set it aside. 6. Pour half of the slightly cooled stock into a blender. Blend with the shells (yes, the shells!) carefully on the lowest speed until it is as smooth as possible. Strain all of the stock through a fine-mesh strainer into a medium saucepan, pressing on the solids to extract as much liquid as possible (you should have about 3 cups). Return the pureed stock back to the pot with the remaining stock. Put the pan over high heat and bring to a boil. 7. Meanwhile, whisk the remaining ½ cup milk into the cornstarch in a small bowl. Whisk the cornstarch mixture into the boiling stock. Return to a boil, whisking constantly. Cook until the stock thickens, about 1 minute. 8. Stir in the reserved lobster meat, and remove from the heat. (The residual heat from the soup will warm the lobster meat.) Season the bisque with the lemon juice, Tabasco, and salt and pepper to taste. Stir in the chives, and serve immediately. Posted on September 18, 2014 September 20, 2014 by emilyturner23Posted in Food & DrinkTagged healthy lobster, lobster recipes.